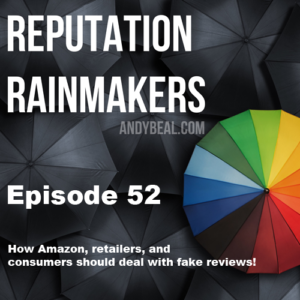 #52 – How Amazon, retailers & consumers should deal with fake reviews! Fake reviews? Whether you’re the marketplace, the retailer, or the consumer, we share reputation management advice! Despite taking previous action, Amazon is still facing an intricate scheme of fake 5-star reviews. Andy Beal: Thank you for joining us. We actually just have one story this week. We almost didn’t do the podcast because we couldn’t find a number of stories, but there was one that Buzzfeed released, and it was about Amazon. If you haven’t seen it, you can click on our notes and read it. It’s a pretty lengthy story, so I’m going to give you like a one-line summary. Despite Amazon previously banning fake reviews because they gave out free products, Amazon is still facing an underground marketplace for retailers where companies are basically offering payment and incentives in exchange for five-star reviews. These are still continually showing up on Amazon, and it’s helping these companies to ship products that maybe don’t necessarily deserve five-star reviews, but they’re getting a ton of them. This has been known for many years. It’s kind of like astroturfing, which is a play on being an opposite of grassroots. Instead of organically growing your review profile grassroots-style, this is astroturfing because you’re basically paying for something that’s artificial. It was kind of shocking to read through that article there and just see how comprehensive this is and just the networks they’re using and the processes they’re using to do all of this. Erin Jones: It’s amazing. I think we’ve discussed this before, but if they put half of that effort into just building that grassroots-positive business, I would really like to see the difference in where they would be because I feel like a lot of these companies spend a lot of time trying to game the system to what end. They’re using networks such as Reddit where you can go in and you can bid to get particular product for free, and then you also get like two or three bucks as well so you can then turn around and sell that product back on eBay or Amazon Marketplace maybe. Yeah, they’ve really, I don’t know, they’re kind of going about this the wrong way. I’ve actually seen this. This is kind of interesting. I actually, I buy many products on Amazon and I look at the reviews, and I actually went through something where I saw this in action because I bought this, it’s a reversible belt. It’s black on one side, brown on the other. I needed something like that for a trip I was going on. It had amazing five-star reviews, but when I got it, it was cheap pleather. I mean like really plasticy feeling and really badly done. I just felt compelled to go leave a review of I think two stars because nobody else was bringing this up. It really made me realize what was going on. What I thought we would do today is break down the story into three different perspectives from a reputation point of view. We’re going to talk about how this affects Amazon and other marketplaces. We’re going to talk about some reputation tips for retailers, and then we’ll finish off with consumers, so how you can dig through them and also how you can protect yourself. Sound good, Erin? Andy Beal: All right. For Amazon, the biggest thing that jumped out to me, they’ve already taken action, but I really think that they should probably build an algorithm to try and analyze the context of these reviews. Instead of just looking at, hey, this is a, seeing a review that says, “Great product, worth the price, fantastic,” whatever it is, whatever the minimum word count is, they should build an algorithm that looks for cliché terms and looks for authenticity in the actual review, build something that’s looking for, to check boxes to say this review is actually legitimate, but Erin, what do you think? Erin Jones: I agree with that. I think another level they could go with that is to look at the actual reviewers and see if they’re … I would guess that some of these reviewers are leaving the exact same review for every product that they’re reviewing if they’re in a hurry. See if the content in their reviews is duplicated, and then maybe actually take a closer look at the actual reviewers. Andy Beal: Yeah, because other marketplaces do something similar to that, like for example, Yelp. If you go and look at Yelp reviews, especially if you’re building a profile where you just go out and you leave one or two really positive reviews, and that’s all you’re doing, those reviews generally don’t get shown up. They get hidden because Yelp’s got an algorithm that tries to detect how authentic it is basically by looking at how many friends you’ve got, how many reviews you leave, what’s the mixture of stars that you leave, all kinds of things that they keep to themselves. Yeah, I think looking at the authenticity of the reviewer is a great system. Even if we just don’t do it ourselves where you can go and just click it yourself, I think Amazon needs to do something where they can order these by, and not just order the actual review that shows up, but maybe even filter out the stars that show up in the overall profile. Andy Beal: Yeah, exactly. Yeah. Erin Jones: … it’s really hard to know. One thing I tend to look at, and this might be jumping towards what the consumers can analyze, but looking at what content is in the review, that’s another thing that Amazon could look at. Instead of just saying, “Five stars. Love this product. Its perfect,” show those reviews that say what does someone love about it, what does someone hate about it, like the most useful option that they have there, and put a little bit more weight on how useful the content of the review is in addition to it not being duplicated all over the reviewer’s profile. Andy Beal: Yeah. There are also monitoring companies out there now that specialize in analyzing reviews on Amazon and then giving you their thoughts based percentage-wise on how likely these reviews are legitimate. You can punch in a product, and they’ll look at the review profile and tell you the chances that this is all automated. If Amazon doesn’t do something like that, then … I guess they got other projects to work on, but they buy so many companies. You think if they don’t actually want to research it and build it themselves, they can at least buy one of these companies that’s out there doing that. Erin Jones: Absolutely. If anyone has the resources to do it, it’s Amazon. Andy Beal: All right, well, let’s talk about the retailers then. What are some of your tips for other retailers that are selling products or selling services that are trying to build good reviews so that they do so in a legitimate way and product their reputation. Erin Jones: I think that this is … Oh, we could talk about this for days. I think the first thing that brands should do is ask. Send a follow-up email when someone purchases something or even put a little note in the box. I know Amazon has some tricky rules about that, but just ask people for a review. You need to be careful about how you do that, but the easier you make the process for the end user, the more quickly it’s going to get done and the more authentically it will be done. Andy Beal: Yeah. I’m same as you, especially when I buy cheaper products that are in the $10-30 range. There’s always some little business card or little note in there that basically suggests if I’ve got five-star review to share, then they’d love for me to share on Amazon, and if there’s anything, the negative that I’d like to share, they give me a telephone number or an email to reach out to them, which I think is generally okay. I mean, like you said, look to get feedback. The key thing is to not offer to give away a product for free if you’ll agree to give five stars. Now, I think there’s an opportunity to give away some kind of discount code or something like that. I’ve seen where it’s like you buy one product, and if you give a review, then you get a coupon for another product, but I think one of the key things is to do so without trying to just get a five-star product, so you’re basically trying to get reviews. You’re asking for reviews, and hopefully, people will give mostly positive reviews, but there’ll be some in there that mixed, and that won’t give you a more organic reputation because it will give consumers something to look at that doesn’t look suspicious. Erin Jones: Yeah, and statistically, people are a lot more willing to trust a brand that does have a mixed mag of reviews than all five-star reviews or even all on-star reviews. Being authentic, again, I feel like we always circle back to being authentic, but being authentic with your audience and letting them know, “Hey, you wouldn’t only be doing us a favor, but you would also be letting any potential customers know what you think about us, what we could do better,” sometimes asking that really generates positive feedback. I’ve seen brands say, “Tell us what we could do better here,” and people come back and say, “Wow, I didn’t expect that. That was really refreshing, and you’re amazing,” but I also think brands need to be ready. If someone does provide some constructive criticism, you need to be ready to act on it. Andy Beal: Yeah. It’s a great idea to consider, hey, look how easy it is for us to get feedback now. Everything’s online. It’s easy to get to from your mobile device. Twenty years ago, we’d have to send out surveys and ask people to fill them out and offer a chance to win a $20 gift card in return, and it would take weeks. We’d have to go through all this manually. Here, you’ve now, and now you’ve got this online process where people can just leave feedback within a couple of minutes and give a few stars for different aspects of your product. There’s a great way to get this feedback so that, yeah, not only you’re increasing potentially your reputation with the number of reviews, but you’re getting feedback on the product, how well it works, any flaws that it has, how it competes against your competitors. Andy Beal: … get five stars. Is that …. They do that right? Erin Jones: They do. I think it’s great. It gives the brand one more chance to make things right. It’s not directing people away from feedback. It’s getting them directly back in contact with you so that you can resolve the situation and then possibly convert them into a happy customer. Andy Beal: Yeah. That reminds me, a few years ago, I built the small company GuestComment where we had iPad kiosk for people to leave guest reviews of hotels, and we did a similar kind of process where it’s, “Hey, please enter in your information. Give us a review. We’ll give you a coupon for a free cocktail.” If it was four or five stars, we would encourage them to share that online, and if it was three or less, we would not only thank them for the feedback, but we would send them an immediate alert to the general manager of that hotel so that they could try and figure out and intervene and resolve any issues before the guest even leaves the property and gets home and uses TripAdvisor. Yeah, having some kind of trigger built in is a great thing for retailers. Erin Jones: That’s all people want. Andy Beal: Yeah, exactly. That really … Honestly, most negative reviews, most negative things, whether it’s a star review or a blog post or whatever it may be, generally happens because they feel so frustrated that there was nobody active enough to resolve the situation while they were either engaged or they just bought their product, whatever it is, and so they then turn to online channels, whatever’s the most popular. That kind of, again, is another piece of advice. You should be focusing on your centers of influence to try and figure out where is it these customers are going to head to. That’s where you want to focus, but as Erin said, you need to try and get to them and resolve it before they even have a chance to get to TripAdvisor, Yelp, or Angie’s List, or whatever it may be. Erin Jones: Absolutely, and to piggyback on your center of influence comment, don’t overwhelm people with choices of places to review. If you send out an email with 15 different review links, that’s the quickest way for me to get to the delete button. It’s overwhelming I don’t have time to leave 15 reviews. Give me one or two, and I’ll make it happen. Andy Beal: Absolutely. All right, so let’s move on then. Let’s finish up with some reputation advice for consumers, and this is both for them making purchases and also to protect themselves. Some tips that we’re going to share, I’ve got one or two. I buy a lot of products online. Here’s something I would definitely recommend. That is, check the reviews that are left and look at the timestamp for the reviews, especially if it’s on Amazon. If you see a ton of reviews that are all within a day or two, then that should raise a red flag because that indicates that maybe these people were all given a free product or an incentive around the same week or two, and they all came on and just kind of, they just came on and left these reviews very quickly. Yes, it might be five stars, but they’re all left over two weeks, and that’s something that would make me want to delve deeper into the other reviews. What about you, Erin? What do you have? Erin Jones: I agree. Another thing that I put more trust in is reviews that have specifics. If a review just says, “This is the best. This is amazing. Wonderful product,” that’s not getting a lot of stock from me because it doesn’t look authentic. When people are really specific about what they love when they’re talking about a restaurant, “Oh, the barbacoa tacos are amazing,” or, “Their iced tea is out of this world,” with Amazon, the texture or color of a fabric, things like that, even how the product is packaged, I’m going to view a lot more authentically because they’ve taken the time to talk about their whole experience from getting the product to testing it out. Even negative reviews. Sometimes, someone doesn’t like something about a product that I love, so if they say, “Oh, I hate the way that this charger plugs into the wall,” that might be something I’m actually looking for. The negative reviews aren’t always going to turn me away from something. For me, the main thing that I put trust in is people that use specifics. Andy Beal: Yeah, I would actually agree and add that I like to look at the review profiles right in between, so the people that have left three stars. I read those to see what did they like or what didn’t they like. I try to figure out what’s the commonality between those to see if there’s any real clues of product issues because if it’s all five-star, I don’t necessarily trust them, and if it’s all one-star, and then I don’t trust that either. Maybe they’re a competitor. Maybe they are, I don’t know, it could be any number of reasons to why they’re leaving a one-star review. Maybe they were paid to do so. Who knows. Another thing you can do is if you do see a lot of five-star reviews on a product, and then you buy it, and then you disagree, then you can help ensure your authenticity as a reviewer by leaving five stars on products you agree with and leaving one, two, or three stars on products that have been getting glowing reviews so that other people can follow you and say, “Yeah, this person is leaving authentic reviews because when I look at their profile, they’re not just all five stars. I see where they have three-star reviews, two-star reviews.” That will really help you. Then lastly, just be very careful about being enticed to leave a free review in exchange for money or free products. I know that can sometimes seem like a good deal, but especially if you do a lot of shopping on that particular marketplace, you can risk hurting your own profile, your own reputation with that particular marketplace on Amazon because people can go click and see how you’ve listed it. I think that just be cautious here. Don’t make it a common thing where you just go on Reddit and get paid of all of them, but if you’ve left a three-star review because there was something wrong, and then they correct it and you up it to four stars, maybe you just put that as an edit on your review, but don’t feel like you’re being incentivized to go one way or the other. Erin Jones: I agree. One last thing that people can do, I kind of like to say, shake off the haters and the fanboys and really read what’s in the middle there because those are the people that are probably going to be a little bit more honest and thoughtful in the review process. Typically, nothing is perfect and nothing is absolutely loathsome, so that middle ground is probably where you’re going to get your best information. All right, well, that’s our tips. Hopefully that’s useful, whether or not you are a marketplace, a retailer, or a consumer. Hopefully there’s something in there you can take along with you. If you have any tips that you’d like to share, head to our Facebook page or just go to andybeal.com and leave a comment and let us know. We’d love to get your thoughts on something that you can add to this or any tips you have for either these companies or for individuals. Erin, thanks for chiming in. Always a pleasure to chat with you. Erin Jones: Thanks for having me. It’s a pleasure to be here. Andy Beal: Thank you all for listening. We really do appreciate. We hope you’ll tune in again next time. Thanks a lot, and bye-bye. Share the post "#52 – How Amazon, retailers & consumers should deal with fake reviews!"